The Security Council today voiced growing alarm at the escalating conflict between Sudan and South Sudan, warning that fighting threatens to take both countries to full-scale war, which in the past brought only death, suffering, destruction of infrastructure, and economic devastation. 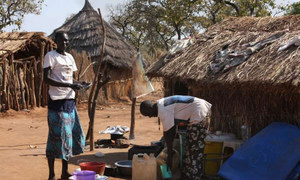 The alarming situation is manifested most recently by the seizure and occupation of the town of Heglig and its oil fields in Sudan by South Sudan’s army, the Sudan People’s Liberation Army (SPLA), the Council said in a presidential statement. “The Security Council demands a complete, immediate, and unconditional end to all fighting; withdrawal of the SPLA from Heglig; end to SAF [Sudan Armed Forces] aerial bombardments; end to repeated incidents of cross-border violence between Sudan and South Sudan; and an end to support by both sides to proxies in the other country,” said the statement read out by Ambassador Susan Rice of the United States, which holds the Council’s presidency this month. “The Security Council affirms its strong commitment to the sovereignty and territorial integrity of both Sudan and South Sudan. It recalls the importance of the principles of good neighbourliness, non-interference and regional cooperation,” the statement said. Members of the Council demanded that both sides redeploy their forces to 10 kilometres away from the 1956 north-south borderline, in accordance with agreements reached last year. They urged both countries to take immediate steps to establish a “Safe Demilitarized Border Zone” and activate the Joint Border Verification and Monitoring Mechanism, reiterating their readiness to continue to support both parties in implementing the agreement with the support of the peacekeeping mission known as the United Nations Interim Security Force for Abyei (UNISFA). The Council also urged both countries to respect the letter and spirit of the Memorandum of Understanding on Non-Aggression and Cooperation of 10 February. It also reiterated its demand that they urgently redeploy their troops from the disputed Abyei area in accordance with previous agreements. The leaders of the two countries should meet immediately as previously planned to address the issues that stand in the way of achieving lasting peace, members of the Council said. In Geneva, Secretary-General Ban Ki-moon warned that war between Sudan and South Sudan would only exacerbate the suffering of the people of both countries. “What is required is political will and political leadership,” he told a news conference. “This crisis requires the full and urgent attention of the international community. I have discussed the situation with US Secretary of State Hillary Clinton yesterday, as well as Ethiopian Prime Minister Meles Zenawi, President [Yoweri] Museveni of Uganda and I will be in close touch with regional and world leaders during the coming days,” said Mr. Ban. “In this moment of inflamed tensions, it is imperative that both sides exercise the maximum restraint, in the interests of their peoples and their common future,” he added. In a conversation today with the President of South Sudan, Salva Kiir, Secretary-General Ban Ki-moon called for an immediate de-escalation of the situation between South Sudan and Sudan in order to avoid further bloodshed.